THURSDAY, APRIL 25 th 2019 Flight via Amsterdam, Paris or Madrid to Bogotá. After arrival transfer to the Hotel Grand Hyatt Bogotá. Official program starts in the late afternoon with a short introduction on the architectural content of the Colombian tour. Dinner at a special Colombian restaurant with local entertainment. FRIDAY, APRIL 26 th 2019 Buffet Breakfast Start of the architectural tours in small units. Lunch in between. Dinner SATURDAY, APRIL 27 th 2019 Buffet Breakfast Continuing architectural program. Lunch in between. Dinner SUNDAY, APRIL 28 th 2019 Buffet Breakfast. Early departure with Avianca Airlines for Medellín. After arrival start of the architectural tours. Separate luggage transfer. Lunch in between. In the late afternoon check in at Hotel Intercontinental Medellín. Dinner MONDAY, APRIL 29 th 2019 Buffet Breakfast Continuing of the architectural program. Lunch in between Dinner TUESDAY, APRIL 30 th 2019 Buffet Breakfast Departure for Santiago de Chile. Arrival in Santiago in the late afternoon. Transfer to the Hotel Santiago Mandarin. Check-in Dinner WEDNESDAY, MAY 01 st 2019 Buffet Breakfast Short introduction on the Chilean Architectural Program. Click here and go ahead if you are familiar with the registration procedure and the completion of the form. - Complete form in small letters and caps! famous Universities. You will have the opportunity to take note of an international approach to design solutions. : world's best graduation projects , an incredible collection of brilliant ideas for the future. An independent jury of architects and designers reviews the submissions for the Hunter Douglas Award which is a highlight of the programme. The final graduation projects will be presented through a dedicated exhibition and an Archiprix 2019 book. Archiprix International offers unrivalled insight into current trends in international architectural design and education. History has shown that some Archiprix winners have become renowned architects. So join us and meet the future of architecture at the Archiprix 2019. Please click here before you complete your first application form. Here you will get full information about the registration procedure — what to do and what you should take in consideration. Archiprix International invites biennially worldwide all schools and universities in Architecture, Urban Design and Landscape Architecture to select their best graduation project. The Archiprix International 2019 is organized in cooperation with Pontificia Universidad Católica de Chile and Universidad de Chile, Santiago. Note All tours during the day will be mainly in small units. The Architectural program will introduce historic landmarks and sites as well as contemporary architectural developments. Optional visits to one of the Archiprix International candidate workshops are on request. Hunter Douglas reserves the right to modify the program. COLOMBIA’S RICH HISTORY AND ARCHITECTURAL REVOLUTION Colombia has a rich history that includes ancient settlements and indigenous peoples, most notably, the Muisca Confederation, Quimbaya Civilization, and Tairona Chiefdoms. The first inhabitants of modern day Colombia arrived in 10,000 BC, and lived in the area that is now the capital city of Bogotá. Colombia’s diverse culture is a product of its unique history, and its African, European and Native Indian influences. This legacy has resulted in one of the most ethnically and linguistically diverse countries in the world with a rich cultural heritage, imposing landscapes and strong regional identities. The country’s colonial architecture reflect their Spanish origin, as seen in the traditional single-story houses laid around a central patio, to be found both in colonial cities like as Bogotá, Tunja or Cartagena, or in rural haciendas throughout the country. Modern day Colombia is making great strides in shaping it’s future. Tourism is rising sharply and there is a significant reduction in criminal activity, not withstanding the difficulties faced by social inequality and the aftermath of a drug trade, the country remains optimistic. 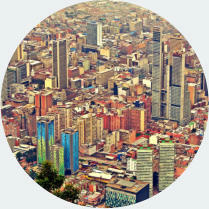 Over the last decade, Colombia has become a touchstone of what enlightened politics and good design can do for cities. If Barcelona was the urban example of the 1990s, urbanist these days are more likely to mention Colombia’s capital, Bogotá, and its second city, Medellín. In both cities, dynamic mayors have undertaken ambitious infrastructures and public buildings projects as tools for social change. At the same time there is real focus on unifying the lower-class favelas and upper class urban areas, investing in education programs and the cultural identity of the country. CHILE’S ARCHITECTURE UNIQUE AND MODERN DIVERSITY Chile has been populated since at least 3000 BC. By the 16th century, Spanish conquistadors began to colonize the region of present-day Chile, but in 1820, the country gained its independence. Chile has endured its share of political struggle with famous figures and revolutionary names including Salvador Allende and Victor Jara. Today, Chile is a prosperous nation, known for a higher standard of living than most South American countries, for its hospitality, geographic diversity and high-quality wine growing regions. 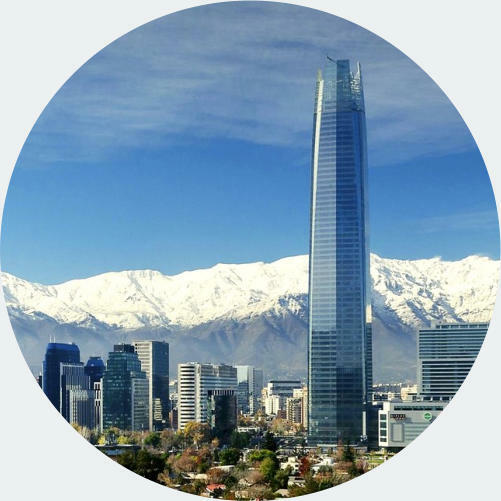 Influences from Pre- Columbian, colonial, neoclassical, and the 19th/20th centuries are visible throughout the country, but Chile is also developing a world class reputation for its modern architecture and design. Traditional colonial aesthetic and contemporary modern architecture can been seen through the variety of landscapes that make up the country. The country was catapulted to the forefront of global attention when architect Alejandro Aravena was named the 41st Pritzker Prize Laureate in 2016 – the first Chilean to receive both the award and appointed the director of the Venice Architecture Biennale. The diversity of Chilean architecture emphasizes simplicity, economy, and functionality across a spectrum that includes post-modernism, eclecticism, rationalism, modernism, and modular architecture. Historical villages and modern work incorporate the design creativity of Chilean architects. Together, they form the new architecture of the country creating a new architectural identity that unite its history and ancestral culture with new building technology with innovative materials and sustainable techniques. Flight Booking There are only three airports from Europe providing direct access to Bogotá and back from Santiago de Chile, which are Amsterdam, Paris and Madrid. Due to the best connection the routing for most of all participants will be on the outbound flight via Amsterdam with KLM and on the return flight via Paris with Air France. To assure the availability we already reserved a big number of seats on KLM as well as on Air France. Certainly we will choose for each participant the most convenient connection with regard to the best balance between flight duration, stop over, tariff as well as getting you forth and back in accordance with the official program schedule. Countries with =/> 10 participants: For all countries with at least 10 or more attendees we will book the best f light connection from your home destination on basis of a group booking . After your registration and approval by HDE you will receive the flight details by e-mail. Countries with less than 10 participants: For all countries with less than 10 attendees we have to book all tickets individually. That implicates to pay full attention on the restrictions which are: • Issuing and paying the ticket within 24 hours to 7 days (depending on particular terms) • Issued tickets are non-refundable and allow no changes (even no name change). Once you’ve confirmed your participation and after approval by HDE you will receive a flight proposal by e-mail. After your reconfirmation we will make a fixed reservation and payment. Please note that costs that may appear due to any change afterwards will be charged to you separately. Completion of the Registration Form should be done only by HunterDouglas General-/ Unit Managers. To activate following steps you need a password provided by HunterDouglas Europe B.V. on request. Since 2001 Hunter Douglas has supported Archiprix International to present the world’s best graduation projects for architecture, urban design and landscape architecture. During the last decade we have travelled the globe with guests from the architectural community to explore exciting host cities and support international young graduates in a unique learning platform that showcases their extraordinary talents. Be part of the next edition of Hunter Douglas Awards Study Trips to unique architectural places around the world. Join another once-in-a-life-time experience leading you to South America again. Explore the architectural highlights of COLOMBIA in BOGOTÁ and MEDELLÍN and of CHILE in SANTIAGO and VALPARAÍSO. CHILE’S ARCHITECTURE UNIQUE AND MODERN DIVERSITY Chile has been populated since at least 3000 BC. By the 16th century, Spanish conquistadors began to colonize the region of present-day Chile, but in 1820, the country gained its independence. Chile has endured its share of political struggle with famous figures and revolutionary names including Salvador Allende and Victor Jara. Today, Chile is a prosperous nation, known for a higher standard of living than most South American countries, for its hospitality, geographic diversity and high- quality wine growing regions. Influences from Pre-Columbian, colonial, neoclassical, and the 19th/20th centuries are visible throughout the country, but Chile is also developing a world class reputation for its modern architecture and design. Traditional colonial aesthetic and contemporary modern architecture can been seen through the variety of landscapes that make up the country. The country was catapulted to the forefront of global attention when architect Alejandro Aravena was named the 41st Pritzker Prize Laureate in 2016 – the first Chilean to receive both the award and appointed the director of the Venice Architecture Biennale. The diversity of Chilean architecture emphasizes simplicity, economy, and functionality across a spectrum that includes post-modernism, eclecticism, rationalism, modernism, and modular architecture. Historical villages and modern work incorporate the design creativity of Chilean architects. Together, they form the new architecture of the country creating a new architectural identity that unite its history and ancestral culture with new building technology with innovative materials and sustainable techniques. • In case of cancellation we will credit and refund the appropriate amount. Entry Requirements All information on this page has been carefully researched. However visa requirements change frequently and the information is provided without any guarantee. All foreign nationals entering Colombia and Chile are required to possess a valid international travel document in the form of a national passport which should be valid at least 6 months beyond the stay. 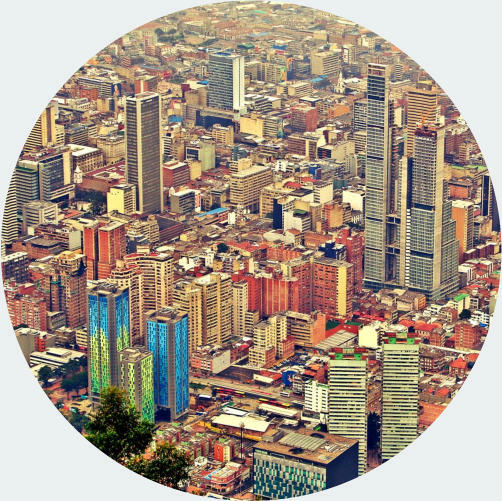 Information which citizen require a visa: Passengers from countries that have restrictions must apply for a tourist visa at the Colombian consulate in their home country. Flight Booking There are only three airports from Europe providing direct access to Bogotá and back from Santiago de Chile, which are Amsterdam, Paris and Madrid. Due to the best connection the routing for most of all participants will be on the outbound flight via Amsterdam with KLM and on the return flight via Paris with Air France. To assure the availability we already reserved a big number of seats on KLM as well as on Air France. Certainly we will choose for each participant the most convenient connection with regard to the best balance between flight duration, stop over, tariff as well as getting you forth and back in accordance with the official program schedule. Countries with =/> 10 participants: For all countries with at least 10 or more attendees we will book the best f light connection from your home destination on basis of a group booking . After your registration and approval by HDE you will receive the flight details by e-mail. Countries with less than 10 participants: For all countries with less than 10 attendees we have to book all tickets individually. That implicates to pay full attention on the restrictions which are: • Issuing and paying the ticket within 24 hours to 7 days (depending on particular terms) • Issued tickets are non-refundable and allow no changes (even no name change). Once you’ve confirmed your participation and after approval by HDE you will receive a flight proposal by e-mail. After your reconfirmation we will make a fixed reservation and payment. Please note that costs that may appear due to any change afterwards will be charged to you separately. opportunity to take note of an international approach to design solutions. : world's best graduation projects , an incredible collection of brilliant ideas for the future. An independent jury of architects and designers reviews the submissions for the Hunter Douglas Award which is a highlight of the programme. The final graduation projects will be presented through a dedicated exhibition and an Archiprix 2019 book. Archiprix International offers unrivalled insight into current trends in international architectural design and education. History has shown that some Archiprix winners have become renowned architects. So join us and meet the future of architecture at the Archiprix 2019. Click here and go ahead if you are familiar with the registration procedure and the completion of the form. Complete form in small letters and caps!